Ok everybody! We’re kicking off this week AND our first app pick of the week with an ode to Monday Night Football. It’s that special time of year where it’s acceptable to yell at your electronic devices while wearing another person’s name on your shirt. Unfortunately, there are too many games on at the same time to watch them all and so I’ve come up with a solution for you. 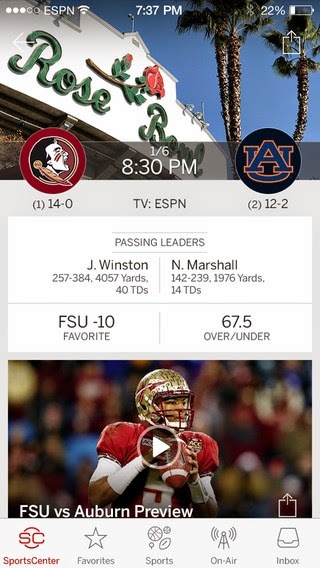 My app pick this week is for ESPN ScoreCenter. (iPhone, iPad, Android, Windows). While you all might have thought this was an obvious choice for managing your NFL intake, I would like to argue that this app is worth noting simply because it is the best. Most sports fans have it; most sports fans that just got a Smartphone for the first time need to download it! This app has live updates, video highlights, breaking news and personalized alerts. Plus this is a FREE app and accessible on ALL platforms. You should download it now and tell me what you think! Do you have another favorite NFL app? I’ll be looking for responses and check in next week! © Car-Tel Communications 2012. Ethereal theme. Powered by Blogger.